Barbara Lynch’s Menton, located in Boston’s Seaport district, was my second-ever tasting-menu experience. The second time is important. Like with anything else, your first time is memorable for its novelty but you don’t know what to expect. It can be nervous or anxious or distracting. Sometimes first experiences are best viewed as test runs. But on the second time around, you know what’s coming, and you can relax and enjoy. Saturday, March 26, 2011. What a long time ago this seems like. I walked into Menton feeling truly comfortable with my appearance, which was a new sensation for me. I had gotten a haircut that afternoon, and my dress was a simple dark purple with black flowers. I bought it at a thrift store a few months earlier—I always got a kick out of that, wearing a three-dollar dress to a three-figure dinner—but the dress blended into the restaurant and so did I. I drank in that knowledge. Here I was, in a fancy restaurant owned by a famous chef, sitting at a table with white tablecloths and multiple forks beside the plate, surrounded by older patrons wearing expensive suits and designer dresses, and I fit in. But what I found most exhilarating wasn’t just that positive feeling of belonging, but what it replaced: I didn’t feel like a misfit. It felt odd, but welcome and new. It was around this time that I first toyed with the idea of writing about food, although I didn’t specifically consider a food blog for another couple months. I did take photos of my food that day. These photos aren’t my best, but I wasn’t thinking of it as “food photography.” I was just a girl taking snapshots of an experience that was making me happy. Here are a few of the better-ish photos from that meal. While I did write down the ingredients for each course, I didn’t take notes on taste so I can’t provide any commentary about the specific tastes of each dish. But that’s almost the point. What brought me here to writing about food, today, was the passion of these moments at a place like Menton, photographing plates and scribbling down ingredients so I could memorialize the whole wonderful experience. I loved every single bite. 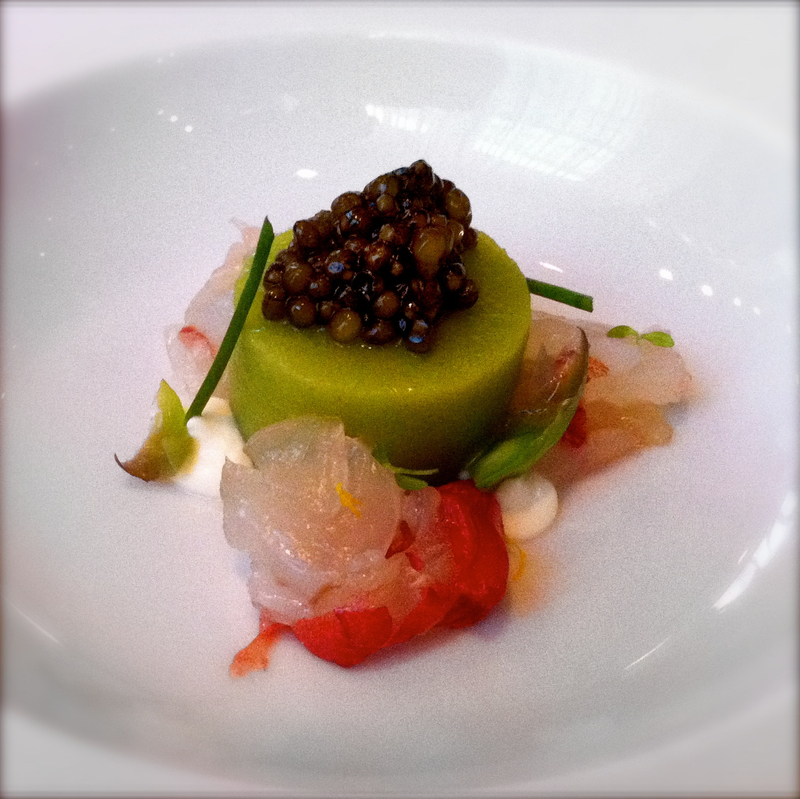 Asparagus gelee with white sturgeon caviar, lobster crudo, and wild onion flower, at Menton. Asparagus gelee with white sturgeon caviar, lobster crudo, and wild onion flower. Ricotta agnolotti with fava leaf and a house-cured sardine, at Menton. 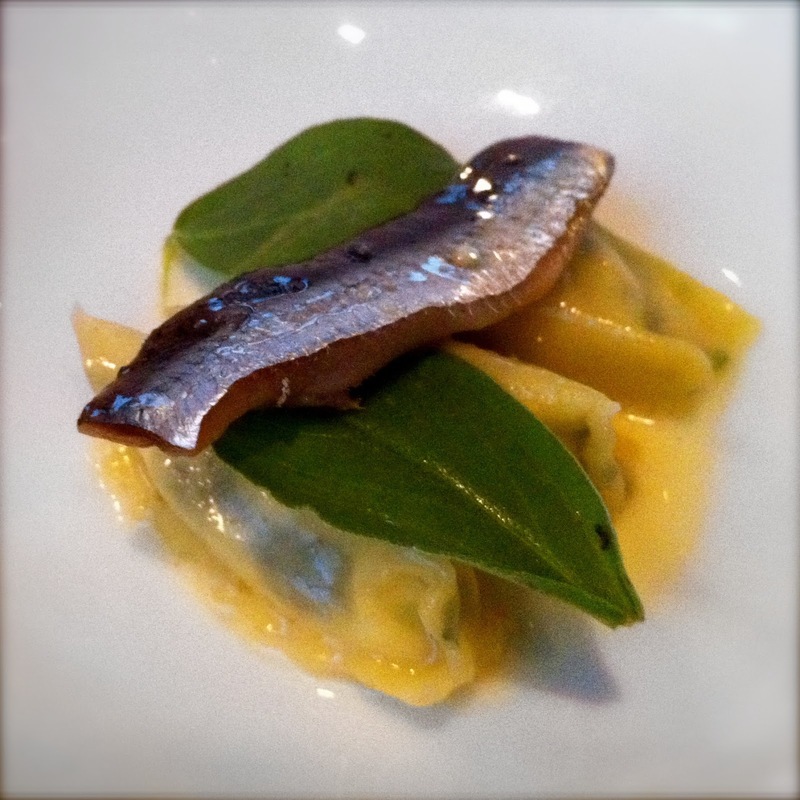 Ricotta agnolotti, a kind of Italian ravioli, with fava leaf and a house-cured sardine. Kataifi-wrapped langoutsines with uchiki kuri squash, pumpkin seed oil and pickled pepper, at Menton. 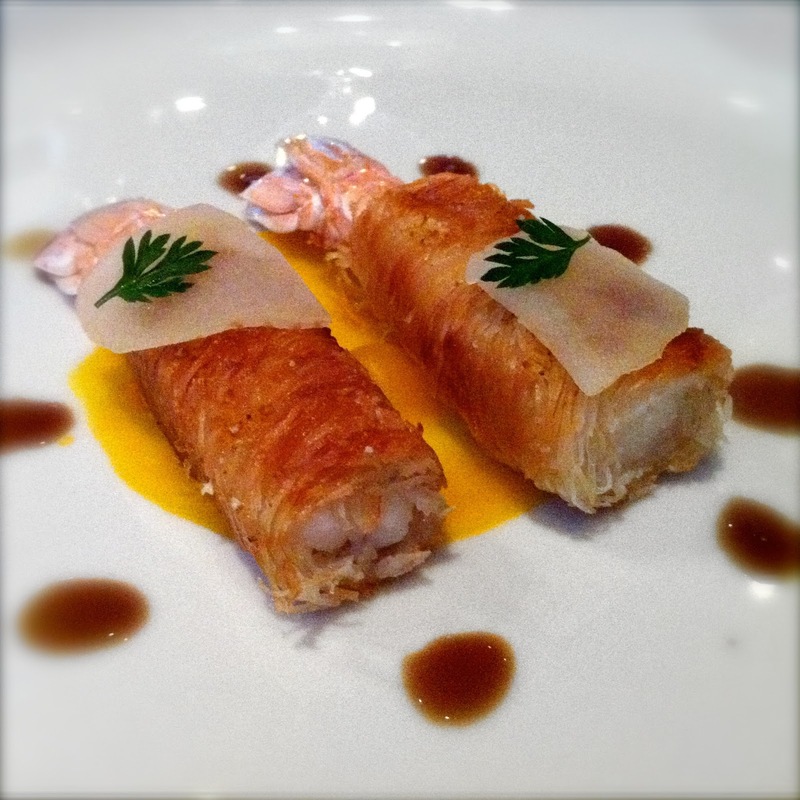 Kataifi-wrapped langoustines with uchiki kuri squash, pumpkin seed oil, and pickled pear. Saturday, December 22, 2012. My second visit to Menton was over a year later. A week earlier I had finished my first semester as a transfer student at Northeastern University. I don’t say “transfer student” anymore, but back then it seemed important. That semester had posed several challenges and it felt difficult, but then I got my grades back. 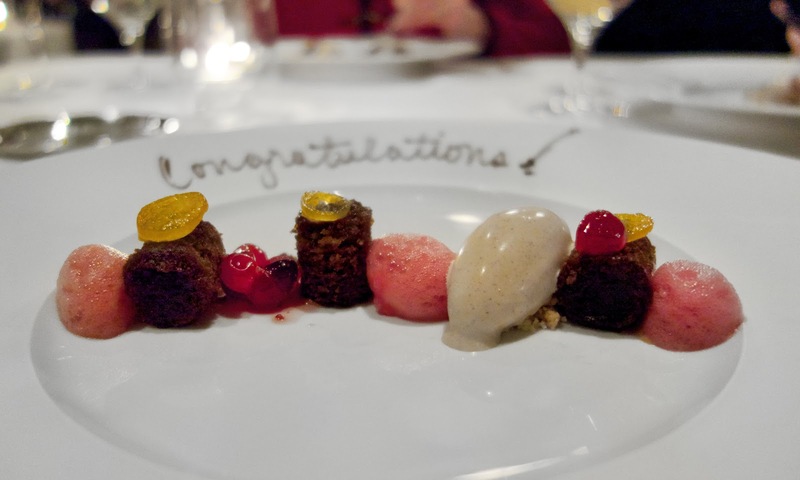 Dinner at Menton was part Christmas celebration, and part celebration of my success! 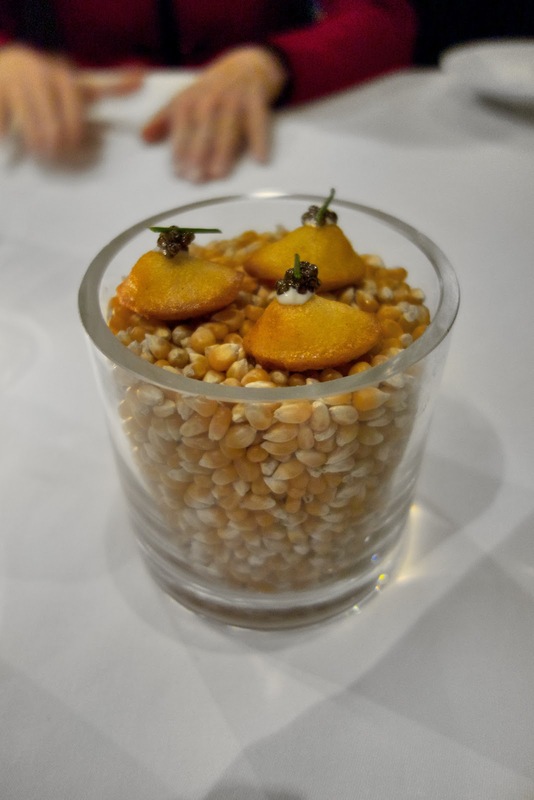 Maybe equally importantly, this visit to Menton was my first tasting menu since beginning my blog. 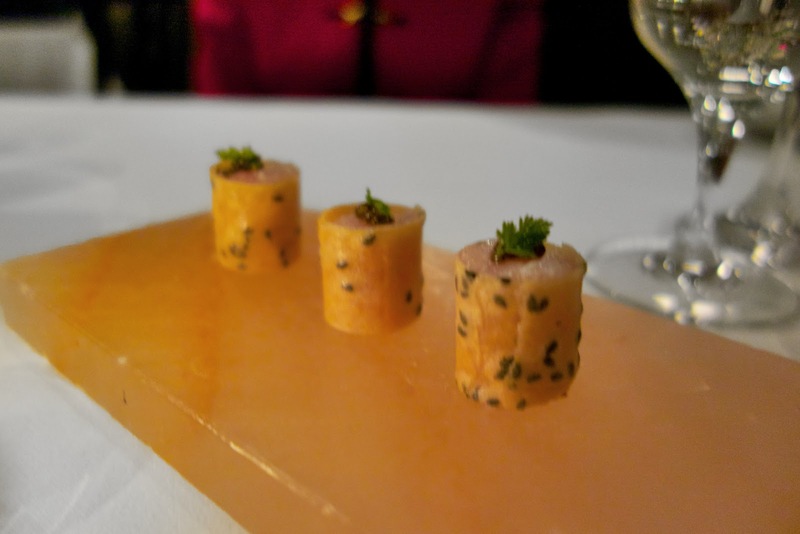 Prior to Menton, my most recent tasting menu had been at Charlie Trotter’s restaurant in Chicago just a few months before it closed its doors (and its two Michelin stars). At Charlie Trotter’s I had just sat back and enjoyed the experience and it was sublime, but to be honest, I missed having pictures and notes. I like doing this. So when I brought my camera to Menton, I was excited. one of Menton’s non-alcoholic drink pairings. The menu offers two options, a prix-fixe or a chef’s tasting. The prix-fixe listed actual dishes, whereas the chef’s tasting listed only sparse ingredients, as if sketches or motifs upon which the kitchen would compose for each table. After some debate, we opted for the chef’s tasting. This proved rewarding. 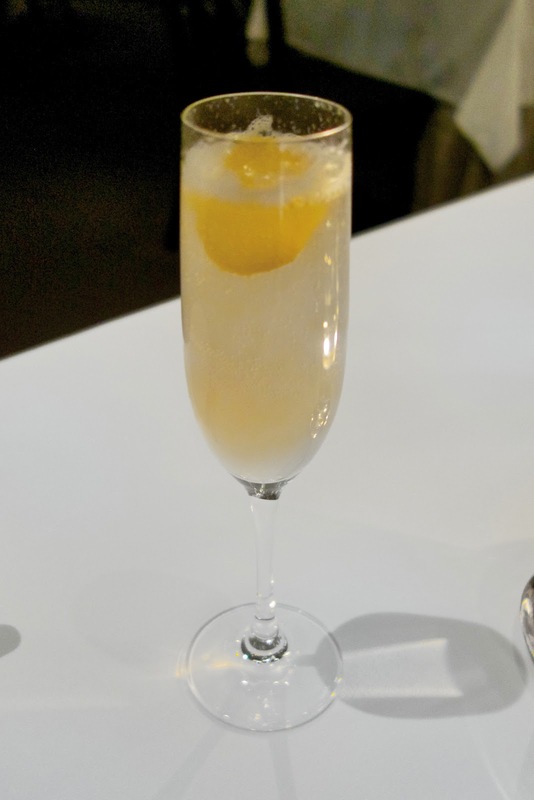 Tasting menus are typically accompanied by wine pairings, but neither my boyfriend or I drink alcohol, so we opted for Menton’s phenomenal non-alcoholic drink pairings that we had enjoyed so much during our first visit. I’ve written a bit about these non-alcoholic pairings before. They are delicious, they are creative, they are bold. It’s always fun when restaurants offer them, and Menton does an excellent job. 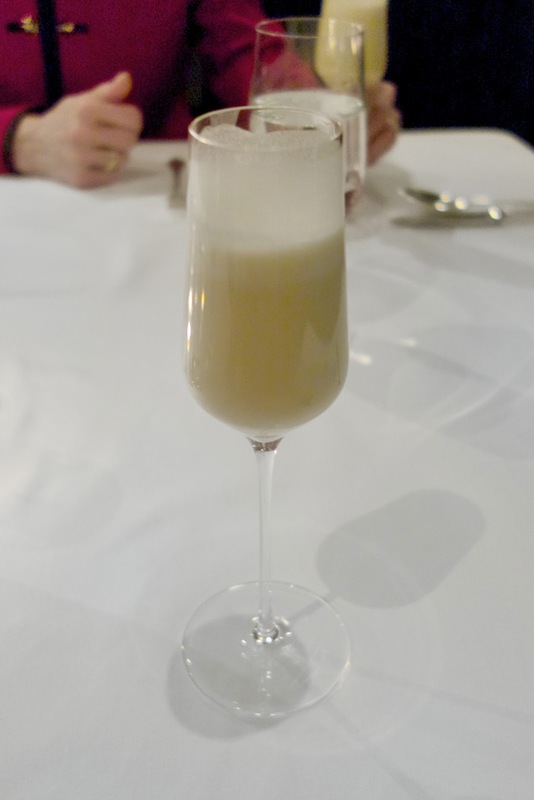 Our first non-alcoholic drink was an elderflower-grapefruit fizz to accompany the amuse bouches. Our waitress mentioned this is one of Menton’s specialty drinks, and indeed, I’d had it before. It is a delicate, floral lightly-carbonated beverage, and I quickly remembered why it had been one of my favorites. 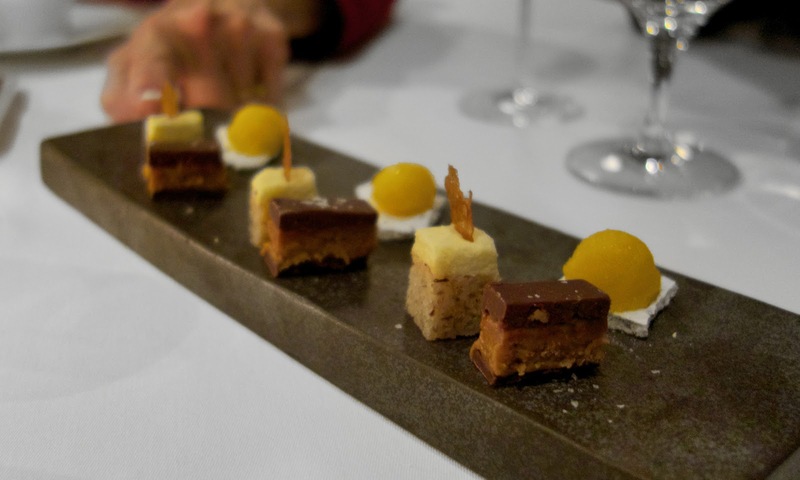 The meal started off with several canapés, also referred to as “amuse bouches.” As we made our way through them, I confessed aloud my secret wish for a restaurant that offered meals composed only of amuse bouches. Can you imagine? Forty or fifty amuses, one right after another. How much fun would that be for a chef, to play with the progression of his/her courses, never mind for diners to eat? But I digress. Hamachi, topped with royal white sturgeon caviar, at Menton. Hamachi, topped with royal white sturgeon caviar. A great first bite to kick off the meal! Onion macaron with chevre and nigella, at Menton. Onion macaron, chevre, nigella. I loved these melt-in-your-mouth bites, the exterior carefully crisp and the interior fluffy. The goat cheese flavor was subtle, almost shy, with the onion and nigella driving the flavor palette. Corn madeleine topped with creme fraiche and caviar, at Menton. Corn madeleine topped with creme fraiche and a tiny dollop of caviar. Weeks later, my boyfriend was still talking about these little corn bites. 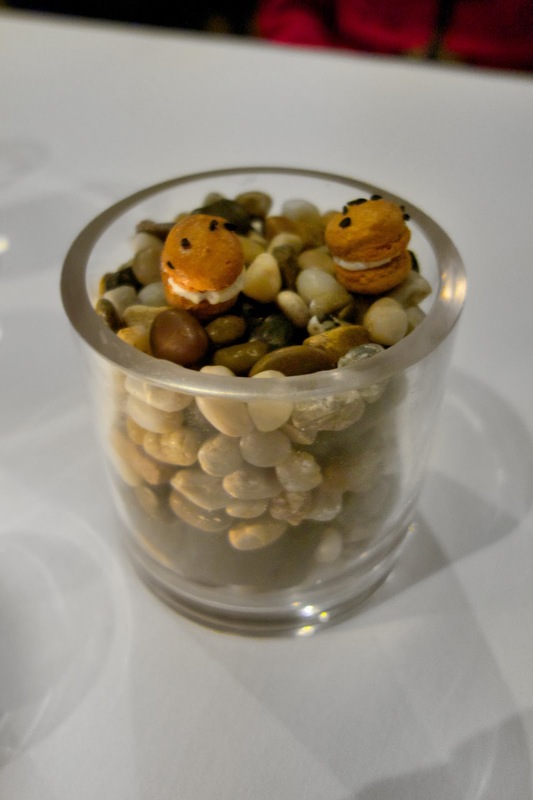 They were served atop corn kernels—very cute! Wild mushroom veloute with a black trumpet mushroom. 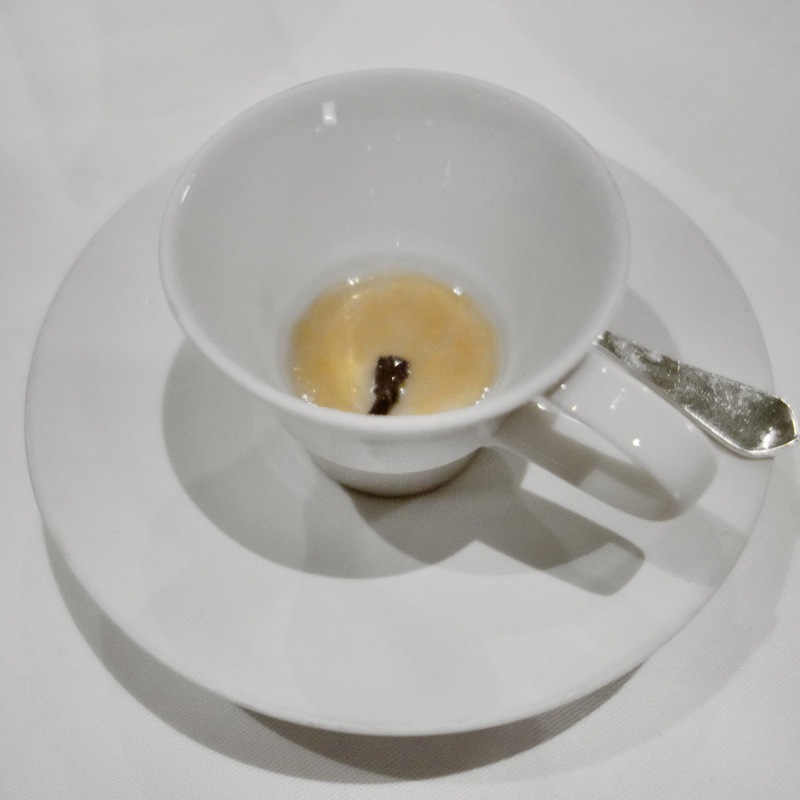 Wild mushroom veloute, with a black trumpet mushroom. This is where I tell you that veloute is one of the five “mother sauces” of French cuisine as determined by chef Auguste Escoffier around the early 20th century, comprised of a light stock thickened with roux (flour and butter). The word “veloute” is the French adjective for “velvet,” and that was exactly the word that came to mind as I ate it. 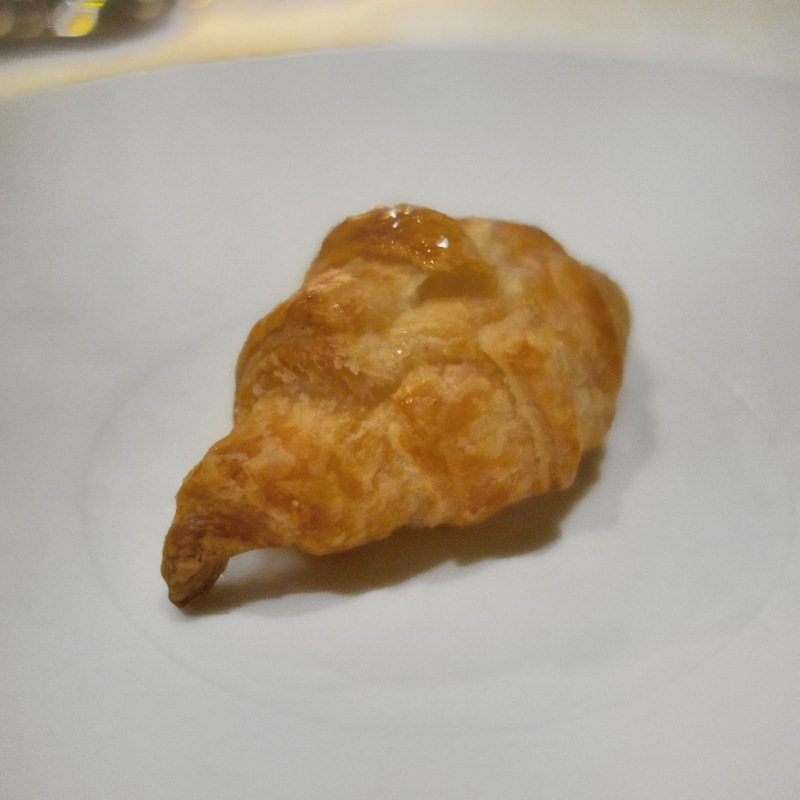 So…here’s what happened with the croissant. Three croissants were placed on the table, one for each of three diners. Diner #3 is avoiding carbs, therefore her croissant was to be split between the other two diners. Right? Everyone knows this. However…that is not what happened. Instead, my boyfriend stole the entire third croissant for himself. I had none of it. THE NERVE OF SOME PEOPLE. According to my careful tally, he currently owes me one (1) Menton croissant; one-half (1/2) box of See’s milk-chocolate butter chews; and one hundred twelve (112) rolls from Legal Sea Foods. The croissant especially stings. Mine was fantastic. Grudgeworthy. Santa Barbara sea urchin with honey crisp apples, radish, and nori chips, at Menton. Santa Barbara sea urchin with honey crisp apples, radish, and nori chips. Nori is edible seaweed, so we used the chips to scoop up the bites of sea urchin and then ate the little chips in the same bite. In the almost-two-years since I’ve begun eating raw fish and other seafood, I have come to like the flavor of sea urchin despite its strange texture. 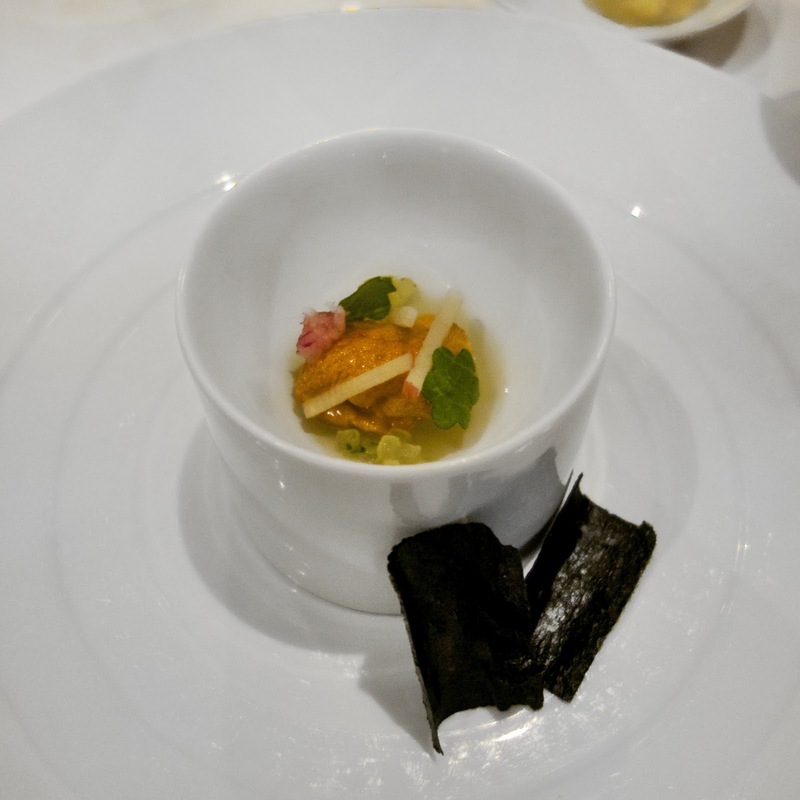 Diver scallop with satsuma, radish, and ginger tea, at Menton. Diver scallop with satsuma and radish in a pool of ginger tea, paired with a ginger-spiced lemonade. Even my boyfriend, who is ardent that scallop is an overused and overhyped protein, agreed that this scallop was phenomenal. The ginger tea was a quiet and fragrant addition to the delicate, tender scallop flavor, while the satsuma added a little burst of citrus. The ginger-spiced lemonade was the ideal accompaniment, with lemony tang complimenting the satsuma, and ginger spice reinforcing the dish’s slight pooling of ginger tea. 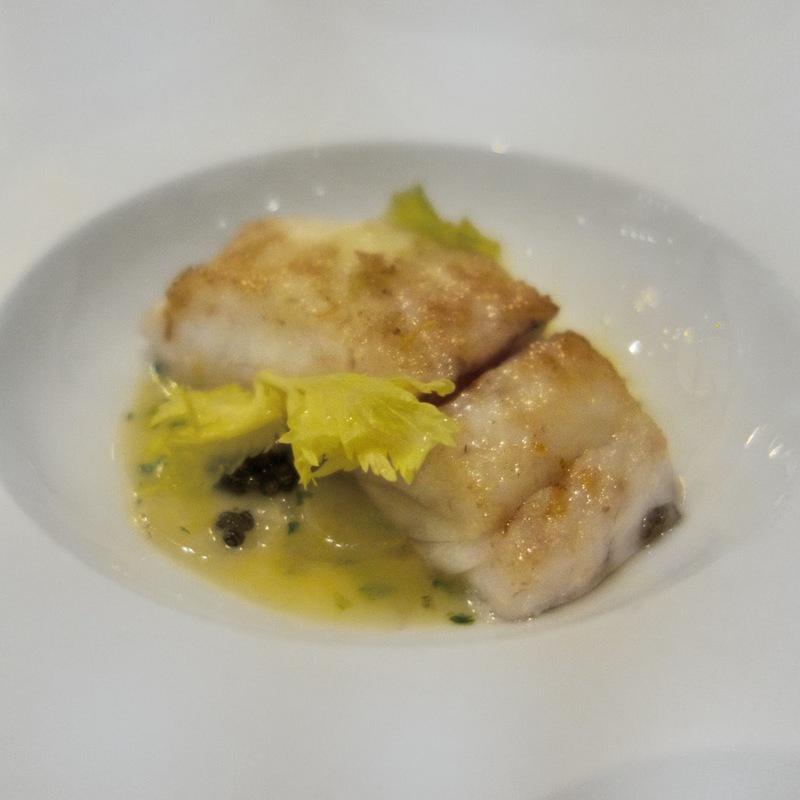 Rhode Island fluke with royal white sturgeon caviar, sauce veronique, and celery leaves, at Menton. Rhode Island fluke with royal white sturgeon caviar, sauce veronique, and celery leaves, paired with a cucumber-mint “All Things Green” drink. The fluke was cooked relatively rare. This dish was understated excellence, with no single flavor overly loud but all of them harmonizing softly in ways I can’t find words to explain. My boyfriend and his mother agreed this was their favorite course of the night. For me, it tied for first place with the discussed-below dessert. The cucumber and mint in the “All Things Green” drink was crisp and sang curiously well with the flavors of the fluke. It reminded me, in a good way, of a non-alcoholic drink pairing I had at L’Espalier with pineapple, cucumber and mint. 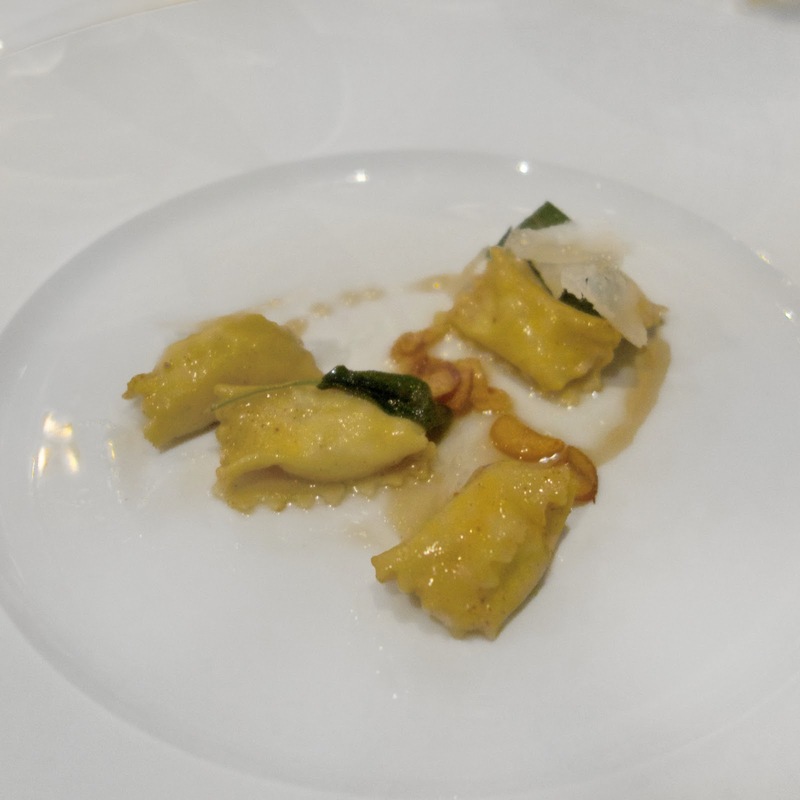 Ricotta agnolotti with chestnut, honey, parmesan, and fried sage, at Menton. Ricotta agnolotti with chestnut, honey, parmesan, and fried sage. I didn’t realize until later when I went back through my photos from my first dinner at Menton that we had ricotta agnolotti then, too. On the sweet/savory scale, this dish leaned more toward the latter, but it worked curiously well as a transition between the white fish and red meat courses. Confit lamb shoulder with kimbe carrot, couscous, and mint, at Menton. Confit lamb shoulder with kimbe carrot, couscous, and mint, paired with a peach-ginger tea soda. This is the classic lamb-and-mint combination. I don’t order lamb very often, but this rendition reminded me of how good lamb can be in the hands of a good chef. Squab breast, heart, and head, with cola vieja vinegar, rutabaga, and burgandy lentils, at Menton. Squab breast, heart, and head, with cola vieja vinegar, rutabaga, and burgandy lentils. We all got a kick out of this dish. 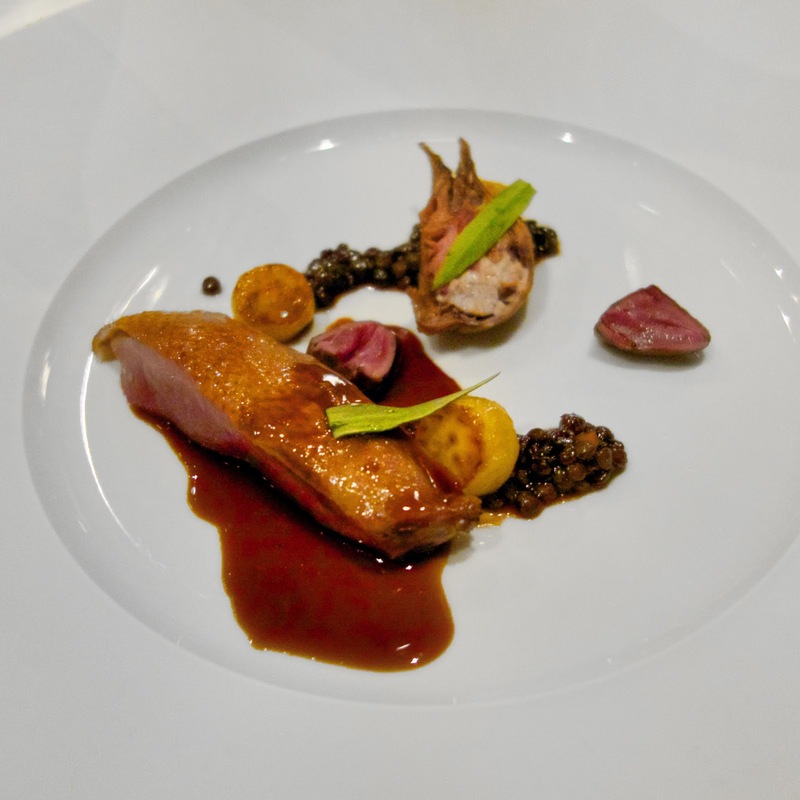 You see squab on the menu and you envision any number of ways that the chef might use it, but you don’t think your plate will have a cleanly severed half of a pigeon’s head. There it was, balanced delicately. Brains and all. A cloven skull. 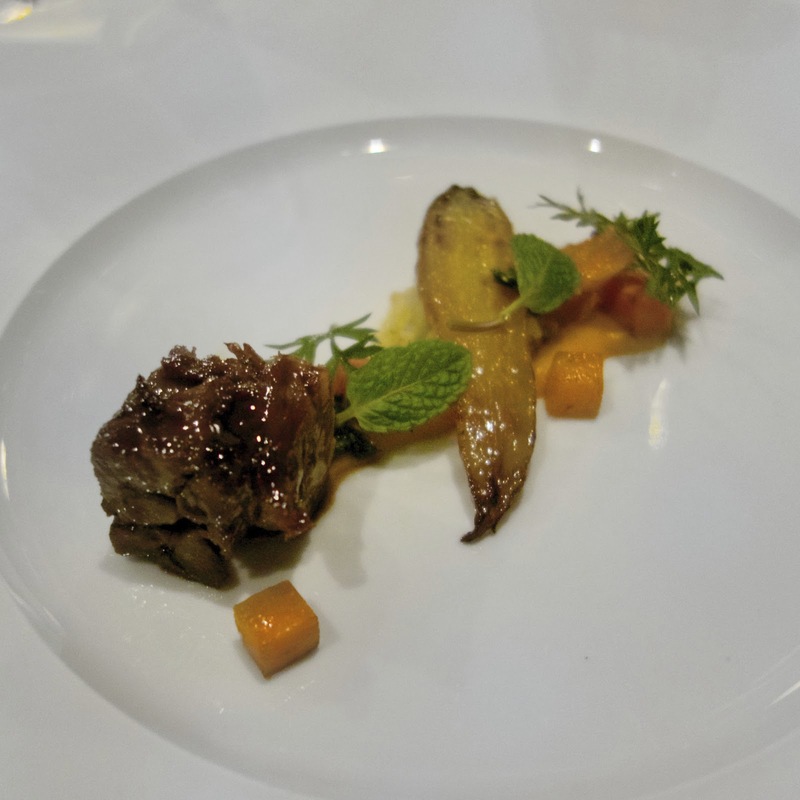 I wasn’t sure how to eat this squab head—I feel like I can be forgiven for that—so here’s what I did: I ate the whole thing. Bones, brains, beak, and all. With one fell swoop I stamped out any lingering remains of my teenage vegetarianism. I decided that while the fluke was still my favorite (savory) course of the night, the squab head was a Hall of Fame new experience and I was glad I tried it. 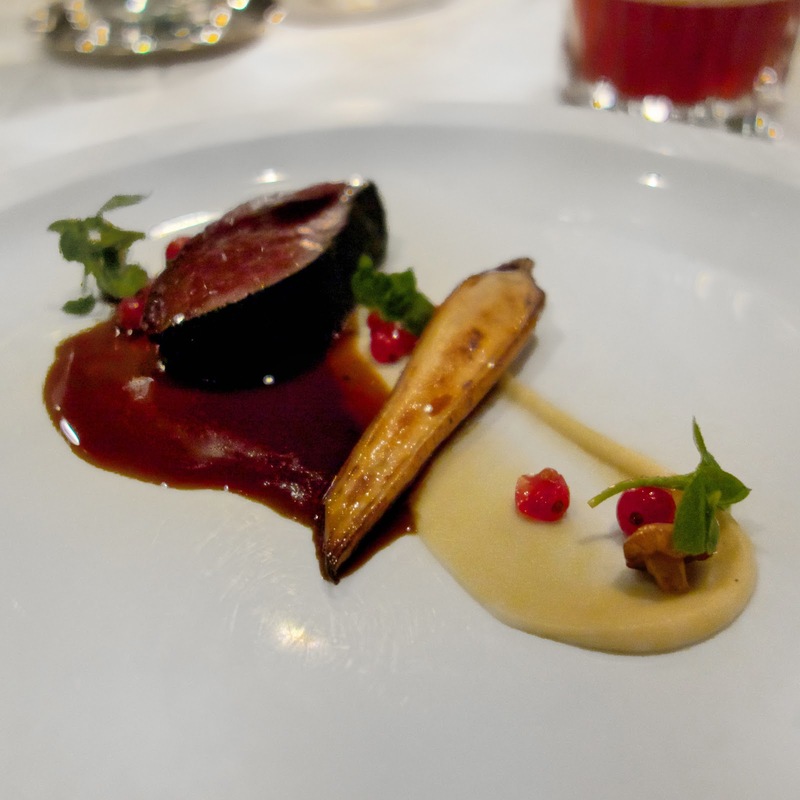 Cervena venison with parsley root, currants, and rosemary, at Menton. Cervena venison with parsley root, currants, and rosemary. The venison was quite rare, as one learns to expect at a Barbara Lynch restaurant. I quite enjoyed my first experience with parsley root. I usually think of parsley only in its herb form rather than its carrot-shaped, parsnip-colored root. The vegetable was similar enough in both name and appearance to “parsnip” that at first I thought it was parsnip on my plate, but upon tasting it there was a subtle difference in flavor, not as strong or as sweet as parsnip. Overall, the dish was a well-executed red-meat finale to the main courses. 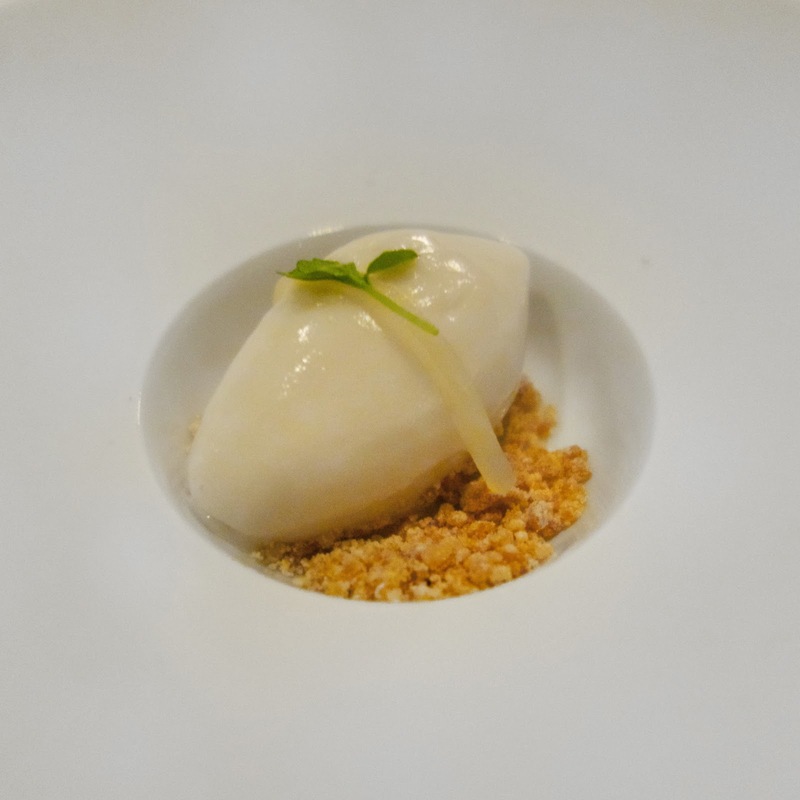 Palate cleanser of chamomile sorbet with a honey crumble, at Menton. Gingerbread pieces, gingerbread ice cream, candied cranberries, and kumquat, at Menton. Dessert, my favorite meal of the day! Gingerbread pieces, gingerbread ice cream, candied cranberries and kumquat. This dessert was perfect for me in two respects. First, I love gingerbread but rarely get to eat it. As a child, the joy of making a gingerbread house was always marred by knowing that the better job I did decorating, the longer my house would display and go stale. Nothing beats fresh gingerbread. And second, I have a penchant for all things sour. The sourness of the kumquat and cranberries provided the acidity needed to compliment the gingerbread’s sweetness, and it drove this dessert home for me. The dessert was paired with a “maple flip” drink consisting of maple syrup, cream, and egg. Our waitress said it was similar to eggnog, but I don’t drink eggnog so I wouldn’t know. Either way, the maple flip was one of my favorite pairings of the evening. Its almond-y Christmas flavor was the perfect accompaniment for the gingerbread dessert. Excellent end, excellent meal! As we left we picked up our printed menus, which described each tasting menu course as well as both the wines and non-alcoholic drink pairings. Menton’s staff must have typed up and printed the menu for us while we were there—one of those extra touches done by classy restaurants to make the experience even more special for diners. 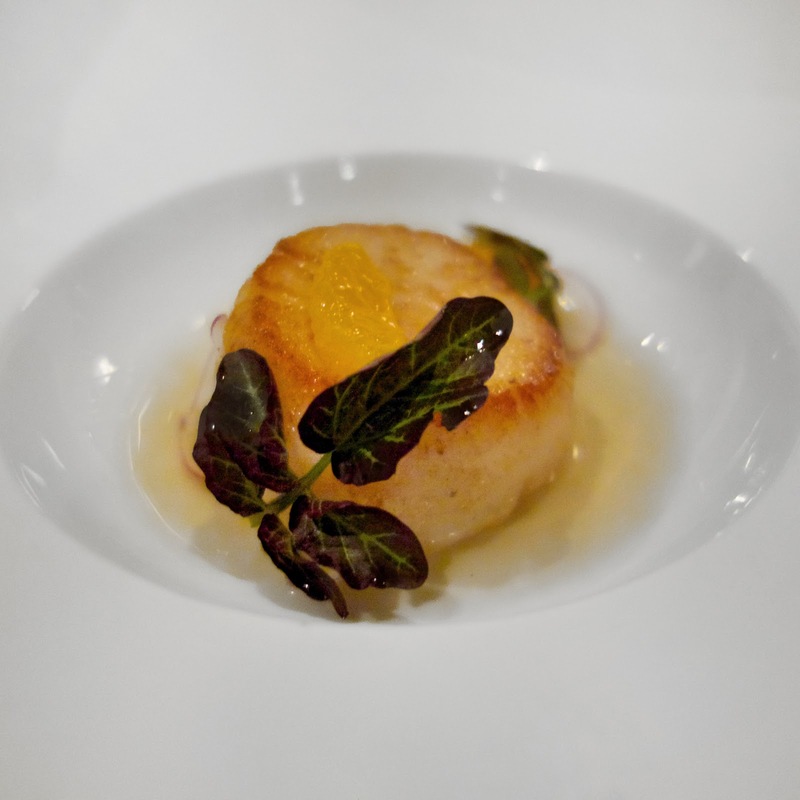 One notable aspect of my dining experiences at Menton is that I have never left feeling stuffed. It’s not easy to compose and execute a large, long tasting menu without leaving your diners feeling like they must roll themselves home. I know, because at this point in my foodie adventures I have experienced enough Michelin-level restaurants that struggle with it. Menton’s execution of measure is commendable. If you’re a foodie in the Boston area, you’re probably already familiar with Barbara Lynch’s restaurants. She’s an icon in the Boston food scene. And now with her protégée Kristen Kish’s victory last week on Bravo’s Top Chef, reservations at Menton will probably be even harder to get. But call anyway. Plan ahead. It’s worth it! I love little dessert bites to end meals. I didn’t write down what these were, but I remember that the one closest to the camera was my favorite because it had the unbeatable chocolate-and-peanut-butter combination. One postscript: On Christmas morning, just a few days after this memorable meal, I unwrapped My Last Supper, The Next Course. This book is the second volume of Melanie Dunea’s “What’s your fantasy last meal?” interviews with famous chefs, and this volume includes Barbara Lynch! I highly recommend these books, both for the interviews themselves and for the stunning photography. Spoiler: Next time I’m in one of Chef Lynch’s restaurants, I’ll order duck. Trying Menton for the first time next week, really enjoyed reading your post. Excellent writing! I felt like I was sitting alongside you eating! Adore Barbara Lynch’s restaurants. Have you tried The Butcher Shop?